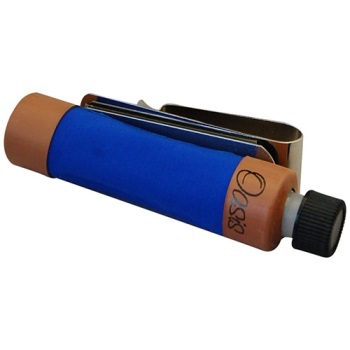 The huge success of the original Blue Oasis "sound-hole" humidifier has brought many inquiries about ways to provide humidification for other instruments including violins, violas, cellos, mandolins, ukuleles, jazz guitars and guitars with flat top cases.After careful consideration, Oasis decided that the best approach to solving this challenge was to develop a humidifier that attaches to the inside of the instrument case. Finding a secure way to attach the humidifier to the inside of the case, and still have it easily removed and re-attached, was no small challenge.Starting with their proven technology, the Blue Oasis humidifier, Oasis inserted two neodymium magnets in the seam of the humidifier*. The magnets then attach to the instrument case using either a steel belt style clip or a stainless steel strip with adhesive backing. The belt style clip fits over the side of the case and provides a flat vertical surface for the magnets to adhere. The adhesive backed stainless steel strip allows for either vertical or horizontal attachment anywhere there is a flat surface inside the case**. An advantage of this type of humidifier is the flexibility to position the humidifier in a wide variety of locations within your instrument case.That's not all folks! Oasis also includes a 10cc. syringe. The syringe will increase the user's control during filling or refilling the humidifier. Since the humidifier holds about 32cc's of water, it will take 3 syringes of water to fill the first time. After that, refills should only take 1 syringe of water. As always, Oasis recommends the use of distilled water which will extend the useful life of your humidifier.